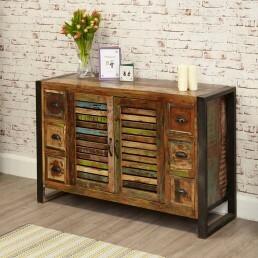 This Urban Chic hardwood furniture collection is carefully hand-crafted utilising reclaimed antique wood salvaged from old boats and buildings in southern India. 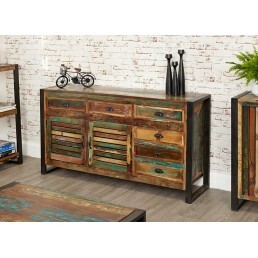 Each piece is lovingly hand finished using a unique blend of reclaimed timbers, every piece is truly individual having a distinct aged grain. Because of this it is particularly environmentally friendly as much of the timber is reclaimed. A beautifully made steel outer frame gives a fantastic urban edge and offers great structural rigidity. Also, it built to the very highest standards by experienced carpenters - This range is designed to last a lifetime. 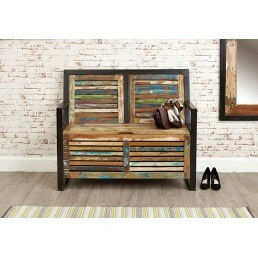 This hardwood furniture collection is constructed utilising salvaged timbers. 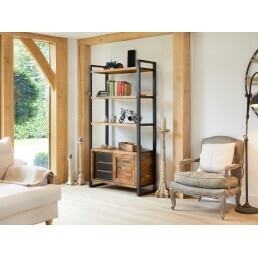 Unique contemporary industrial style large open bookcase with storage. FEATURES The e.. 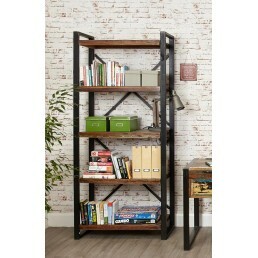 Unique contemporary industrial style alcove open bookcase. FEATURES The overall dimen.. 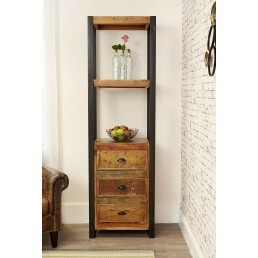 Unique contemporary industrial style alcove bookcase with drawers. FEATURES The exclu.. 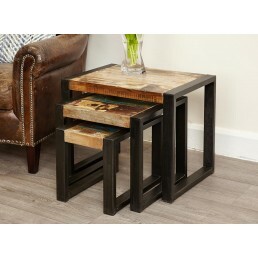 Unique contemporary industrial style lamp table or bedside cabinet. FEATURES The excl.. 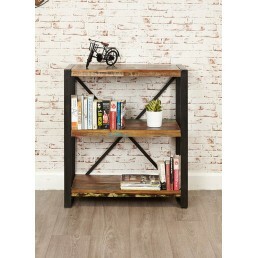 Unique contemporary industrial style low open bookcase. FEATURES The exclusive Urban .. 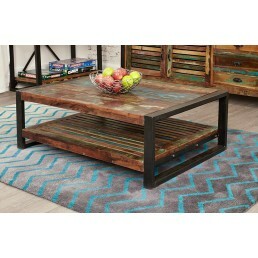 Unique industrial style contemporary large coffee table. 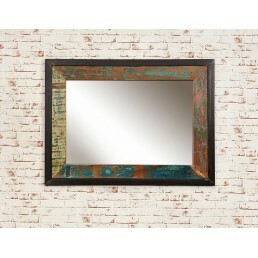 FEATURES The exclusive Urban.. 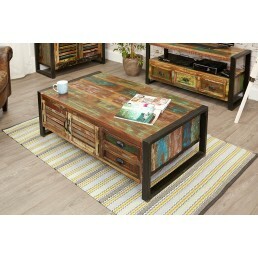 Unique industrial style contemporary large 4 door 4 drawer coffee table. The exclusive Ur.. 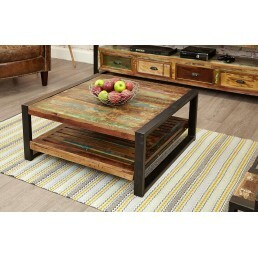 Unique contemporary industrial style square coffee table. FEATURES The exclusive Urba.. Unique contemporary industrial style console table. FEATURES The exclusive Urban Chic.. 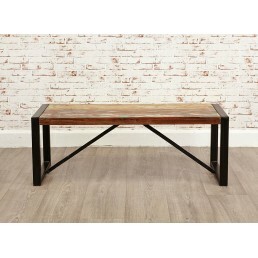 Unique contemporary dining bench The exclusive Urban Chic range is made using reclaimed.. 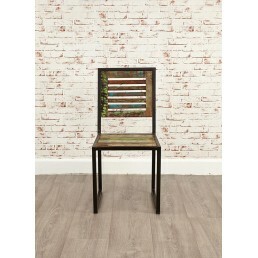 Unique contemporary dining chairs (pack of two) The exclusive Urban Chic range is made .. 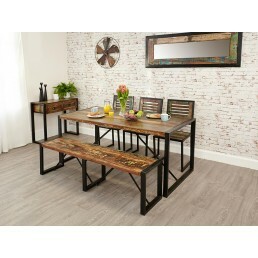 Unique contemporary large dining table The exclusive Urban Chic range is made using rec.. 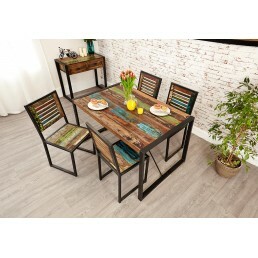 Unique contemporary small dining table The exclusive Urban Chic range is made using rec.. 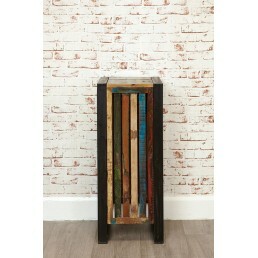 Unique contemporary tall slatted plant stand / lamp table The exclusive Urban Chic rang.. 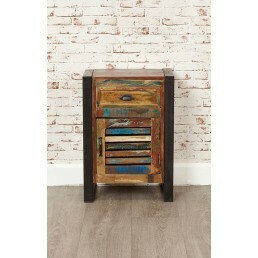 Unique contemporary one drawer one door lamp table The exclusive Urban Chic range is ma.. 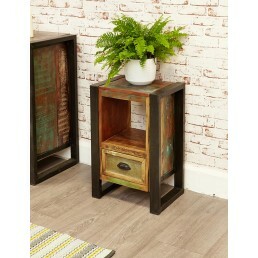 Unique contemporary one drawer plant stand / lamp table The exclusive Urban Chic range .. 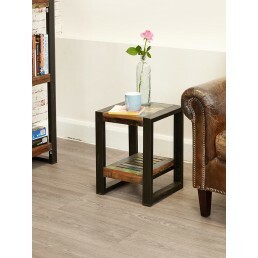 Unique contemporary low plant stand / lamp table The exclusive Urban Chic range is made.. Unique contemporary large open bookcase. FEATURES The overall dimensions of the bookc.. 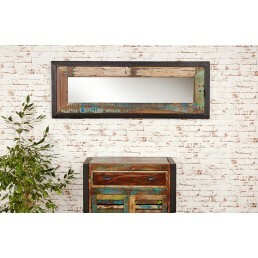 Unique contemporary industrial style large sideboard. FEATURES The exclusive Urban Ch.. 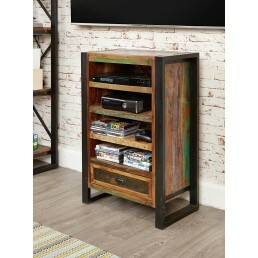 FEATURES Unique contemporary entertainment cabinet The exclusive Urban Chic range i.. 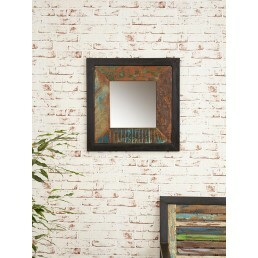 FEATURES Unique contemporary mirror The exclusive Urban Chic range is made using re.. 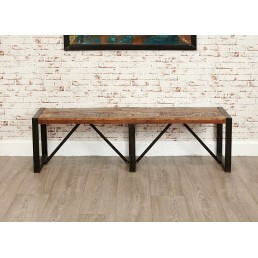 FEATURES Unique contemporary monks storage bench The exclusive Urban Chic range is .. Unique contemporary industrial style round dining table. FEATURES The exclusive Urban.. 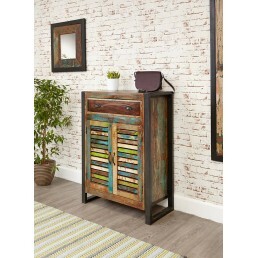 FEATURES Unique contemporary shoe storage cupboard The exclusive Urban Chic range i.. FEATURES Unique contemporary 6 drawer 2 door sideboard The exclusive Urban Chic ran.. 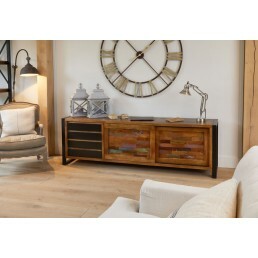 FEATURES Unique contemporary large sideboard with six drawers The exclusive Urban C.. 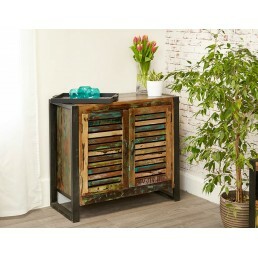 Unique contemporary small sideboard The exclusive Urban Chic range is made using reclai.. 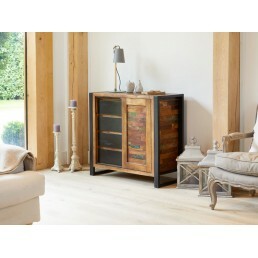 Unique contemporary industrial style storage cupboard. FEATURES The exclusive Urban C.. FEATURES Unique contemporary laptop desk / dressing table The exclusive Urban Chic .. 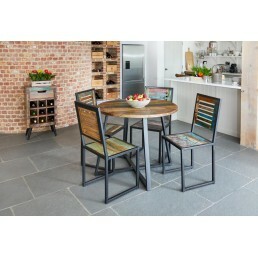 FEATURES Unique contemporary nest of tables The exclusive Urban Chic range is made .. 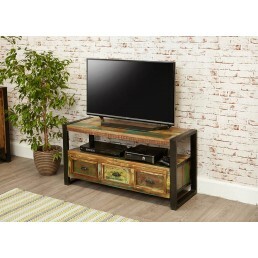 FEATURES Unique contemporary widescreen television cabinet (up to 80") The exclusiv.. 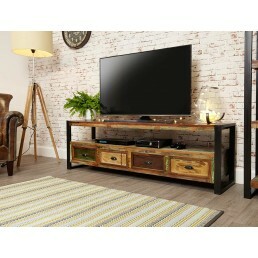 FEATURES Unique contemporary widescreen television cabinet (up to 60") The exclusiv.. 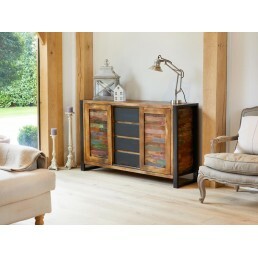 Unique contemporary industrial style ultra large sideboard. FEATURES The exclusive Ur..